Let’s face it: it’s too hot to use the oven when it’s the middle of a scorching summer season. Hell, I don’t even enjoy cooking on the stove-top or on the indoor grill in the summer. Anything that gives off heat makes me groan. But some things are necessities. I have a bunch of chicken in the freezer that just isn’t getting cooked because, well, it’s frozen and I don’t want to get the oven baking. I decided to buy two, tear them up and see how many different meals we can get out of them (as well as how many dishes — to see how economical this was). Theoretically, these two birds should feed us all week if I play my cards right. Granted, I’m a white-meat gal. I have issues with the dark meat (largely texture-based), so the legs and wings will be going to hubby (and I’m sure he’ll be happy about that!). 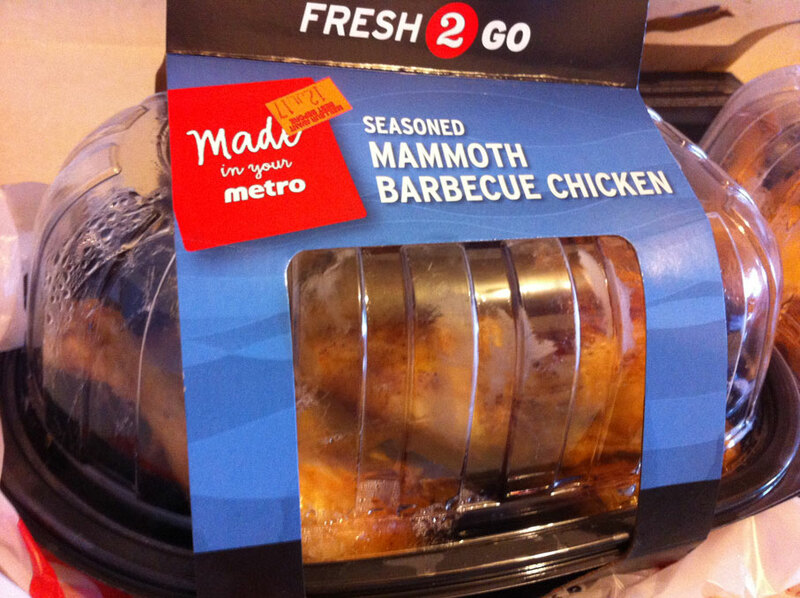 In other words, forgive me if this is breast meat-centric. 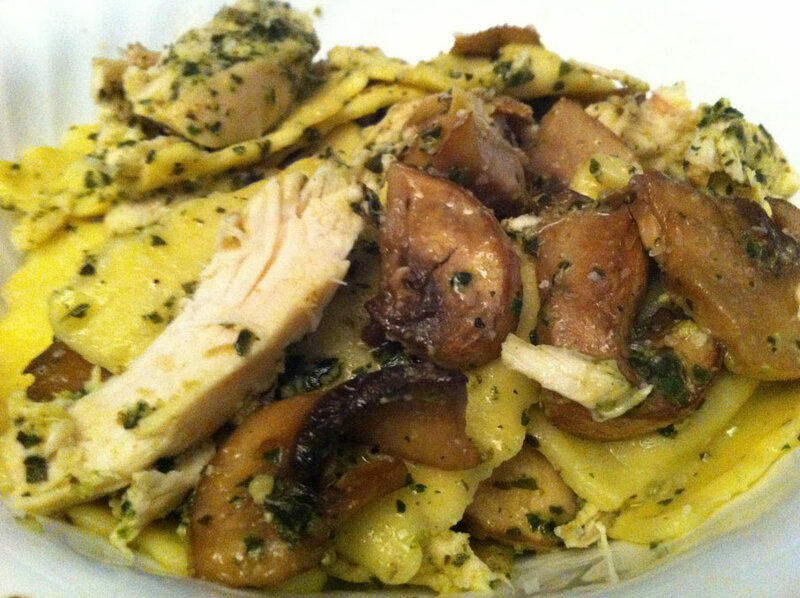 Roasted chicken & sauteed mushrooms over pesto-slathered cheese & spinach ravioli. Prepare the pasta according to the package. 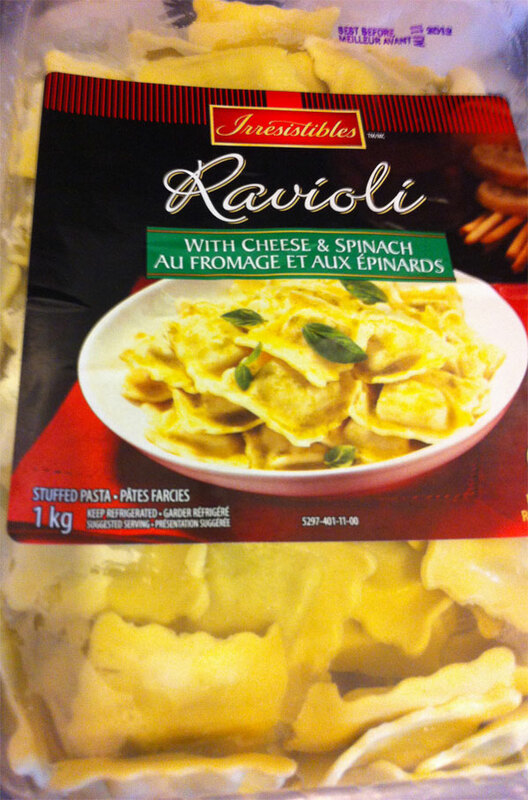 The ravioli I buy says it takes 7-9 minutes but I find 5 minutes just about does it for us. We like ours a little firm. 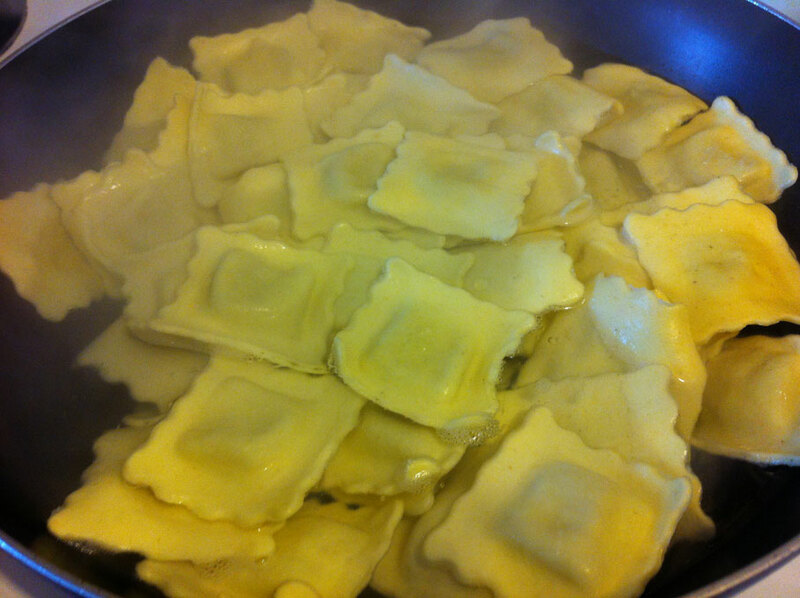 While the pasta is boiling, sautee the mushrooms in the olive oil and butter on medium or medium-low heat. 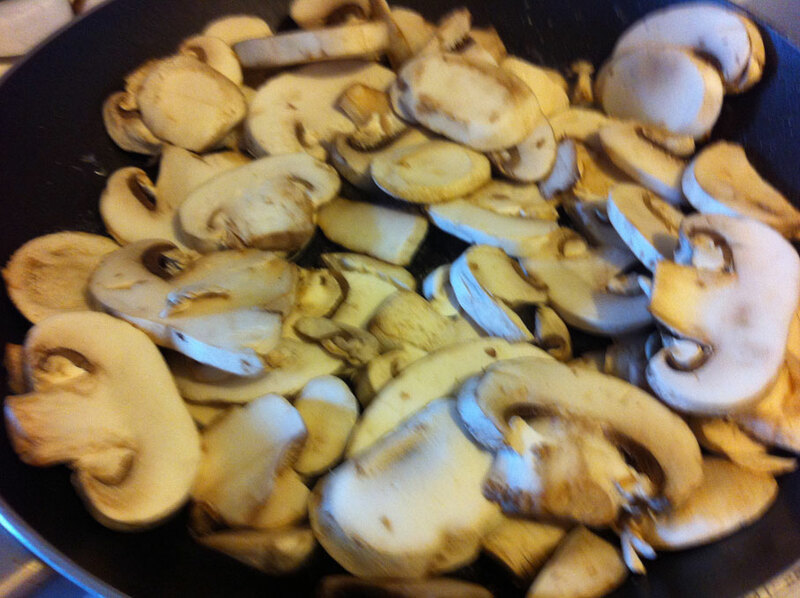 Sprinkle the garlic powder into the olive oil and butter just before you add the mushrooms for a little extra flavour. Drain the pasta and pour into a large bowl. Add the cooked mushrooms and the chicken. Add the pesto and maybe a little extra olive oil if you’re finding it difficult to mix the pesto in evenly. Serve while still warm, sprinkled with a little salt & pepper to taste, if you wish. It’s that easy. I made up that entire package of pasta and that will feed hubby tonight before work, give me a lunch tomorrow and him a dinner tomorrow as well. In fact, we’ll probably be eating this through till and including Wednesday. Feel free to halve this. I purposely made up a huge amount of this to carry us through most of the week. Later this week: quick & easy chicken w/Indian sauces (yes, the same VH bottled stuff I’ve used in the past). I’m all about easy meals in the summer! This entry was posted in comfort food, leftovers, quick meals, quick-and-easy, stove-top and tagged butter, garlic powder, mushrooms, olive oil, pasta, pesto, ravioli, roasted chicken. Bookmark the permalink.